(Medical Xpress)—It took nearly two months, but the videos from the May 6th-7th national BRAIN Initiative meeting are now available online. Although the title of that workshop made central mention of the idea Physical and Mathematical Principles there really wasn't too much of all that. We did cover some thoughts from one of the speakers, Terry Sejnowski, regarding temporal coding in olfaction, but the real neural engineering detail many want to hear about from the BRAINI explorers was recently slipped in with much less fanfare. A draft that appeared on the Arxiv preprint server entitled "Physical Principles for Scalable Neural Recording," gets right to the heart of the matter with a theoretical exploration of limits to introducing hardware into the brain. In particular, the authors assess four major methods of neural recording - electrical, optical, NMR, and molecular recording - and attempt to define the energetic and volumetric constraints that each must operate within. Three names on the Arxiv paper, Ed Boyden, George Church, and Konrad Kording serve as suitable summary for many of the innovative ideas for recording large scale brain activity maps. They note that the current state-of-the-art in optical microscopy is recording 100,000 neurons at 1.25 second resolution in transparent zebrafish brains using light sheet microscopy, or alternatively, recording perhaps 1000 neurons at 100 millisecond timescale with a 1-photon fiberscope in behaving mice. Not bad, but still a way off from large scale recording at the scale of a human level. What is a little concerning however, is that they go on to say that the human brain, consuming about 15 watts of power, performs the equivalent of 10^17 FLOPs, at least according to one definition. These guys know that the brain has no decimal point, and that it does not in any shape or form produce floating point computational ops, so let us hope that this is the last time we hear such talk. The same should be said for attempts to calculate entropy-per-spike train for flies, or extrapolating up orders of magnitude in brain size to create an entropy-per-firing rate function for a mouse brain. Where the paper becomes invaluable is when it turns to the topic of energy dissipation inside a brain that is receiving a constant power influx. Implanted devices may be powered from without, and also may generate power from within to record, stimulate, communicate, and move. The heat generated needs to be dumped somewhere by the brain, and temperature increases of just a couple of degrees must be considered prohibitive. Similarly, hardware added to the brain takes up non negligible space, whether it is intracortical, intraventricular or the intracapillary space. In highlighting the importance of not disrupting the natural blood circulation, the authors point to recent work in whole brain functional imaging. I am not sure here, but I think the intended reference was to be to the recent work in defining a cortical angiome, the fine scale geometry of the interconnected vascular network. The term angiome has been suggested before, and it is good to see that it is becoming more widespread in use as it will no doubt be of increasing importance. More critical to the problem of heat dissipation, recent studies on the brain's glymphatic system (coined from glia + lymph)give us some hint as to how to proceed. Like any natural river system, several times the total flow through the river itself actually occurs through the surrounding soil and bedrock. Similarly in the brain, there is significant parallel extravascular flow that is carried in part through concentric lymph channels, and then intracellularly transduced through astrocytic endfeet. It will be important to work with the natural flow of blood, glymph, and CSF in exhausting excess heat generated by hardware. If one is itching to apply engineering terms to the brain, perhaps this is the proper place. One consideration in this vein would be to define a Peclet number for various brain microstructures. Generally, the Peclet number is a dimensionless description of flow as the ration of advection to diffusion. The microscale temperature profile of the brain is undoubtedly quite rich, and probably enjoys rapid natural dissipation, at least at the scale of mitochondrial movements. In the brain, mass flow is undoubtedly much different from heat flow. Peclet numbers for heat flow would be defined by the thermal diffusivity of different natural tissues, and perhaps also by artificial heat sinks strategically deployed. The arxiv paper does a nice job of describing molecular tickertapes in light of the energy requirement in the form of ATP to build them. The authors feel that while significant, the energy needed to write redundant tapes to give significant accuracy would not be prohibitive to a cell. However, it is far from clear that tickertapes will even be necessary, particularly if real-time spike data is desired. In fact, there may be far more interesting things that could be done at the real-time genetic level within the high-priced real estate of the nucleus. The fantastic explorations of the paper only begin at tickertapes. Combination with virus-enabled barcodes may permit new ways of targeting machinery to specific neural circuits. High resolution MRI that is not limited by the diffusion of water could make use of non-diffusable spins. X-ray imaging of live cells may be possible if suitable contrast agents are devised. There is much to be discovered in this paper, and hopefully it will be the starting point for many new neural-recording technologies. Simultaneously measuring the activities of all neurons in a mammalian brain at millisecond resolution is a challenge beyond the limits of existing techniques in neuroscience. Entirely new approaches may be required, motivating an analysis of the fundamental physical constraints on the problem. We outline the physical principles governing brain activity mapping using optical, electrical,magnetic resonance, and molecular modalities of neural recording. Focusing on the mouse brain, we analyze the scalability of each method, concentrating on the limitations imposed by spatiotemporal resolution, energy dissipation, and volume displacement. We also study the physics of powering and communicating with microscale devices embedded in brain tissue. Nice work, John! Thanks for taking time to understand what the paper is really about and for sharing your insights. 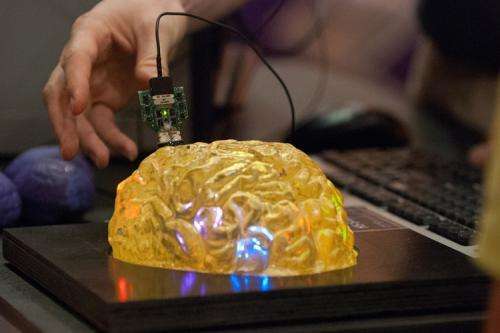 Why Not attempt 3-D Printing Brains of Dead?